So, it's been a decent month. 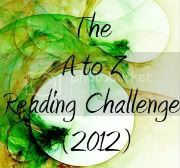 I read more than this but these are all that fit in this Challenge. I think the letters are going to start to thin out! I need to take a look at the titles I have on the shelves here.